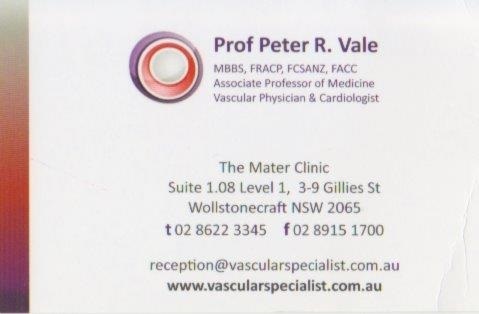 Saw Assoc Prof Peter Vale today. He’s a cardio vascular physician and vascular disease medical specialist. That’s a fancy way of saying he deals with diseases of the heart, veins and arteries. I was referred to him by my surgeon Matt Lyons, when I found out I had clots in my leg. Seemed like a decent, no nonsense sort of bloke about my age. I waited for the prolix dissertation resplendent with Greek and Latin words designed to impress me with his erudition. They didn’t come thankfully. He reviewed the CT scans on my leg. Because there is still a small clot there I have to stay on blood thinners for another couple of months. More Rivaroxaban/Xarelto. Probably another 2 months of it. I had hoped to get off it today as it’s making me tired. He said my leg is still pretty swollen. He also explained that Xaralto is not a blood thinner, it just prevents blood clots from developing by blocking a protein in the blood called Factor Xa, a substance that’s important for forming blood clots. Rivaroxaban does not make your blood thinner, but causes it to take longer to clot. Pretty bad if you cut yourself shaving. Did not have energy to do much today. Pretty hard swim from Manly to Shelly at 6.30am. Still dark, water gin-clear and dead flat. Loads of fish. Pushed really hard on the way back. Definitely started to turn the fitness corner with my swimming. Wore a pair of proper, lace up, leather shoes for the first time today. Hard to get on and they squeezed my right foot for awhile, but not too bad. Guess that’s a milestone!